When it comes to used cars, Byrne Auto has a very special niche in the market. 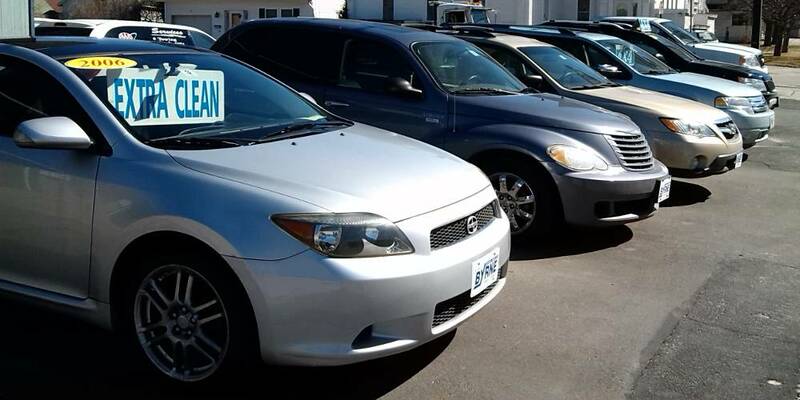 Though we specialize in used vehicles under $10,000, our main focus is on safe, reliable cars and trucks in the $4000 – $7000 range. That’s a tough price range to sell a quality used vehicle. If you visit a used car superstore, or the used car department of a new car dealership, and tell them you’re looking for a $4000 or $5000 car – you’ll probably be laughed off the lot. Either that or they’ll begrudgingly show you a few of their “throwaway cars” that they’ve done absolutely nothing to, because they don’t want to bother with a vehicle that isn’t $15,000 or more. And if you actually buy one of their “throwaway vehicles” – you’re ON YOUR OWN! But at Byrne Auto, a $4,000 – $7,000 car or truck is our “raison d’etre” – the reason we are in business! We thoroughly inspect each vehicle, do more repairs, and replace more questionable parts than any other dealer selling cars in this price range. Why? Because the other dealers want to make the same amount of profit on a $5,000 car as they do on a $15,000 or $20,000 car. Therefore, they won’t replace parts that may pass inspection now but won’t for much longer. At Byrne Auto, we replace these questionable parts, because we don’t want our customers dealing with costly repairs immediately after purchasing a vehicle. We have built a very solid reputation for 35+ years by selling affordable used vehicles that last! Customers have come back time and time again and told us that the car they bought from us was the best used car they ever bought! Our customers get more years out of a low-price used vehicle than they ever expect – and because of that, when it finally is time to get another vehicle, they come right back to us. Repeat customers are a giant pillar of our business model. As a matter of fact, because we have so much repeat business, we do not have to advertise a lot. As soon as we have new cars on the lot, repeat customers from years back will purchase them. Our advertising budget per vehicle is a fraction of what the other dealers spend, and the savings are passed on to you! Don’t just take our word for it, ask around! You’ll soon learn why car buyers from Gorham, Berlin, Whitefield, North Conway, and all parts of the White Mountains and Great North Woods regions of New Hampshire do business with Byrne Auto. In fact, we have our fair share of repeat customers spanning northern New England, from Maine to Vermont. Shopping for used cars is not normally something people look forward to, but if you do business with us, you’ll join the growing list of people that say, “It’s a pleasure buying from Byrne!”.